A contemporary line perfect for off premise catering and banquets. Use behind the scenes or in front of guests. 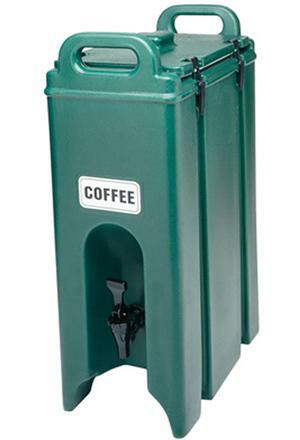 Keeps beverages hot or cold for hours. One piece, seamless double-wall polyethylene with thick foam insulation. Wide nylon latches are easy to open and close with one hand. Drip-proof recessed spigot for easy self-serve access. Stack units on riser to fill large cups or coffee pots. Sta-stack interlocking ensures stable stacking during transport and storage. Self-adhesive beverage label set with each unit.